There’s obviously much more to this analysis then a couple of lines on a graph, but the history of structural  deficits in recent decades is that they are largely the result of cutting revenues rather than raising spending. ….That doesn’t imply that spending shouldn’t be on the table in the budget talks—though the real pressures come in the future, through health care—whacking food stamps, education, and so on is just plain mean. But it’s awfully hard to look at this graph and see support for that Republican mantra. 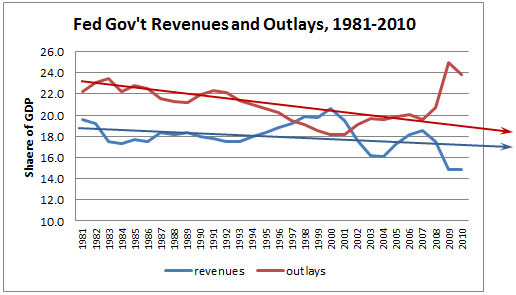 I’ve added some handy lines to show the general trajectory of spending and taxes over the past three decades. Putting aside the Great Recession, which has temporarily cratered revenues and imposed a burst of stimulus spending, the trend is clear: spending has generally gone down, but so have taxes. Future healthcare expenses are a big issue, but the current deficit just hasn’t been primarily a spending problem. It’s been a tax cut problem.